Der G.W. Tiger (P) ist ein deutscher Selbstfahrlafette der Stufe 8. Konzeption einer schweren Selbstfahrlafette auf Basis eines verlängerten Porsche-Tiger-Chassis. Es ist bekannt, dass Ferdinand Porsche eine Selbstfahrlafette entwickeln wollte, die Arbeit daran wurde aber nie begonnen. Der G.W. Tiger (P) führt zum G.W. Tiger. The G.W. Tiger (P) is the first of three very similar German SPG's. 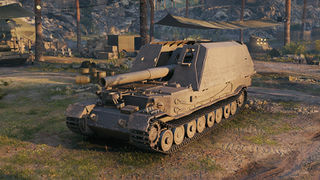 All three mount a 21 cm gun when upgraded, dealing 2000 alpha damage with the HE round and 1550 damage with a 303mm penetration AP round. Being the lowest tier to mount the gun, the G.W. Tiger (P) has the worst stats on the gun, with the longest reload, worst accuracy, and longest aim time of the three. 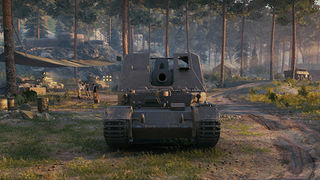 However, you get massive alpha damage at tier 8, able to remove one half or more of a same tier heavy's HP in one shot. However, the G.W. Tiger (P) has extremely low mobility, with slow movement, acceleration, and hull traverse. This makes it extremely hard to defend yourself against close in scouts, especially ones that move horizontally to you, forcing you to turn. The G.W. Tiger (P) does not see much use in Clan Wars events with a tier 8 cap. 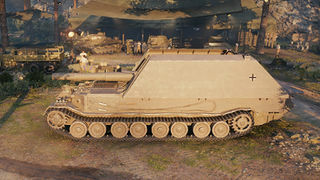 The vehicle's in-game description is incorrect. No historical records of the G.W. Tiger (P) exists.